This may be the most unique accessory you have ever seen for your Touring Bike. Imagine the ability to steady your bike as you come to a stop, have it held upright at a light or stop sign with your feet on the pegs (you really should put them down, but you don't have to!! ), then have the support automatically retract as you accelerate !! 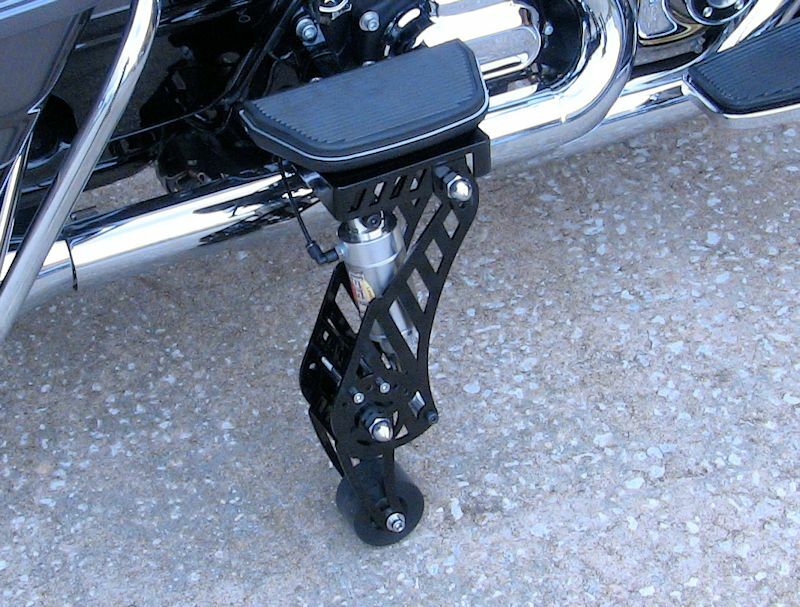 The Patented Leg Up system was created for those who for whatever reason are concerned about, or unable to hold up these 850 lb monsters as they come to a stop. New riders, bad knees, bad hips, bad passengers (couldn't resist! ), or any other reason someone might want a little help keeping the rubber side down... This will do it! The system was originally designed for 1998 and later Harley touring bikes. 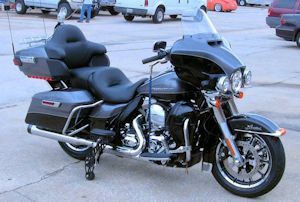 Recently it has been adapted to GL1800 & GL1500 Gold Wings, Harley Dynas & Softails, and others. Click This BOX to Go to LandinGear.Com for More Info! The patented, computerized system is centered around a compressor system and pneumatically controlled legs, that lower, at the touch of a button. This system will only allow the wheels to lower under 6MPH, and will balance the bike completely on level terrain. You still put your feet down, but LegUp makes it feel much lighter and is always there to help! The onboard computer senses speed and wheel position and upon acceleration, if the operator does not retract the wheels, LegUp will raise them automatically. Semi-automatic deployment (lowering) of the wheels is also supported! With the wheels down, you can't lean your bike at all; IT IS EFFECTIVELY a TRIKE! The wheels tuck neatly under the bags when not deployed, allowing the bike to be leaned and handle exactly as it always has. Can't do that with a trike or other hokey outrigger systems. The installation Requires no cutting or modifications to the existing bike at all !! Since releasing the new GEN II product to the public in May of 2013, hundreds of riders from around the world have enjoyed the assistance LegUp GEN II is able to provide. 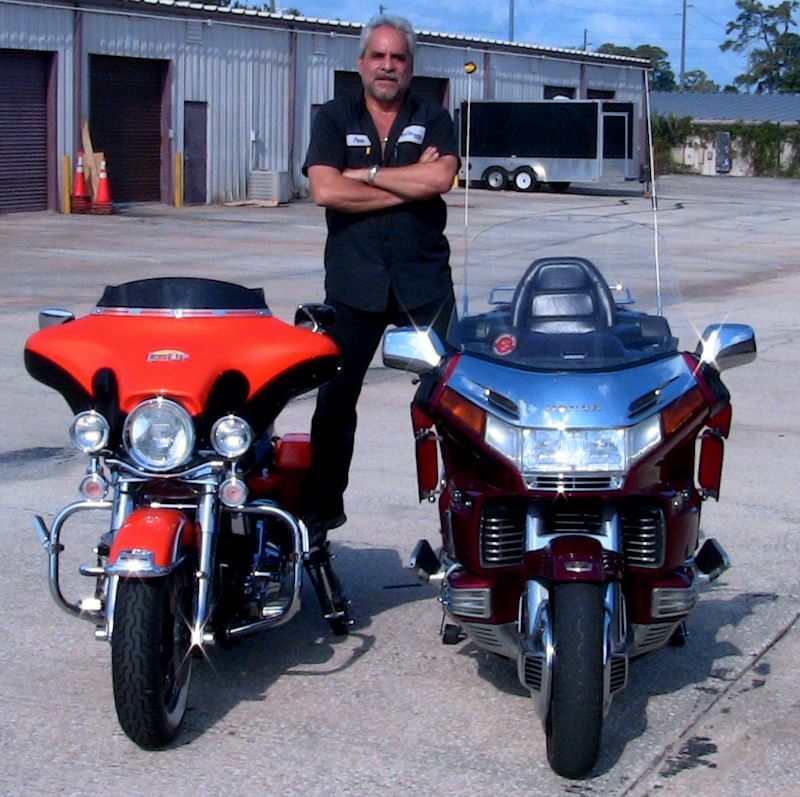 Please understand that LegUp is just that; an assistant to help you balance these big bikes as you start, stop and maneuver them slowly! LegUp is not a Trike system, but for many can give them the benefits they would need from a trike, and still allow them to ride their bikes as they always have! 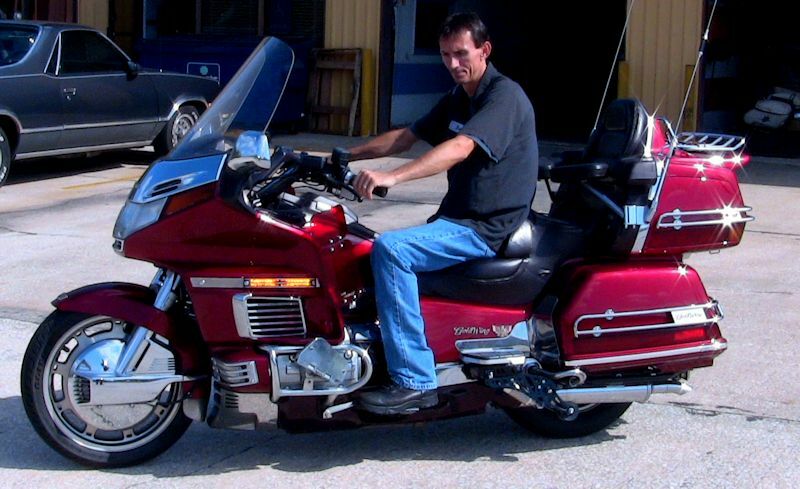 The system costs $3,499 for most bikes and $3,750 for Harley Softails (see our SAVE $50 Page for specifics), and we will install it on your Harley for $400 or your Gold Wing for $600. The system can also be installed by any qualified shop. Compare this cost with awkward alternatives that don't let you ride a motorcycle (THREE WHEELS is NOT the same as TWO WHEELS ). There is Absolutely no cutting or changes to your bike that cannot be reversed if you sell your bike or wish to move LegUp to another bike. Click THIS! to see our Owners and Install manuals. Please click on the PHOTOS for a larger view, and watch the VIDEO below, or check out our ad in 'Hot Bike Baggers' Magazine. You may contact us with questions at 407-834-5007 or Info@landingear.com. DEALER INQUIRIES INVITED! Forget Trikes, Sidecars or Outriggers... Get a LegUp!